Goddess Durga and Goddess Bhagavati are manifestations of Goddess Shakti. The Goddess Durga form of Mother Goddess is worshipped throughout India. The Bhagavathi form is worshipped mainly in Kerala and few temples in Karnataka, Maharashtra, Tamil Nadu, Andhra Pradesh and Goa. There is a difference between Durga and Bhagavathi worship. Bhagavati means 'goddess' ‘holy one’ or ‘divine one’ and it is a common epithet for Goddess Shakti in India. Today, for a Hindu devotee there is no difference between Durga, Bhagavati and Bhadrakali. The names are used by a devotee to describe Mother Goddess. 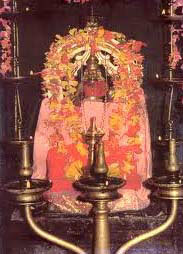 Bhagavati is an important Goddess in temples in Kerala especially those associated with Shaktism. She is worshipped as the main deity in many popular temples like Attukal, Chettikulangara, Kodungalloor, Chottanikkara etc. Almost all villages had a Bhagavati temple in Kerala. She is the benevolent virgin mother. She also takes the fierce form of Bhadrakali to annihilate the demon Daruka. Presence of Bhagavati is felt in a particular sacred place. There are numerous such places mainly grooves which are not disturbed. Goddess Durga is fierce form Goddess Shakti that appears to quell Adharma and restore Dharma. Goddess Bhagavati is a peaceful form of Goddess Shakti. The dominating aspect of Bhagavati is motherly affection. Goddess Bhagavati becomes fierce like Durga, Kali and Chamunda when her children are harassed or attacked by those treading the path of Adharma. So you will find fierce form of Goddess Bhagavati being propitiated during festivals and special occasions. On all other occasion, she is the caring and compassionate mother. When Bhagavati takes the fierce form she is referred to as Durga, Bhadrakali or simply Bhadra.